"My first tattoos were the two on my wrists, which are sketches by the 20th century British poet Stevie Smith. When I was 21, I was going through a rather intense phase where I couldn't read anything but Smith's weird, deceptively-light rhymes, and I fell in love with her accompanying illustrations. Even though I'm a writer (or perhaps because I'm a writer? ), I've always been averse to the idea of putting actual words on my skin, but Smith's sketches strike me as being visual poems. I chose them because they remind me of her work, which acknowledges the reality of the world's darkness while maintaining a sense of humor. The larger ones came in the following two years. 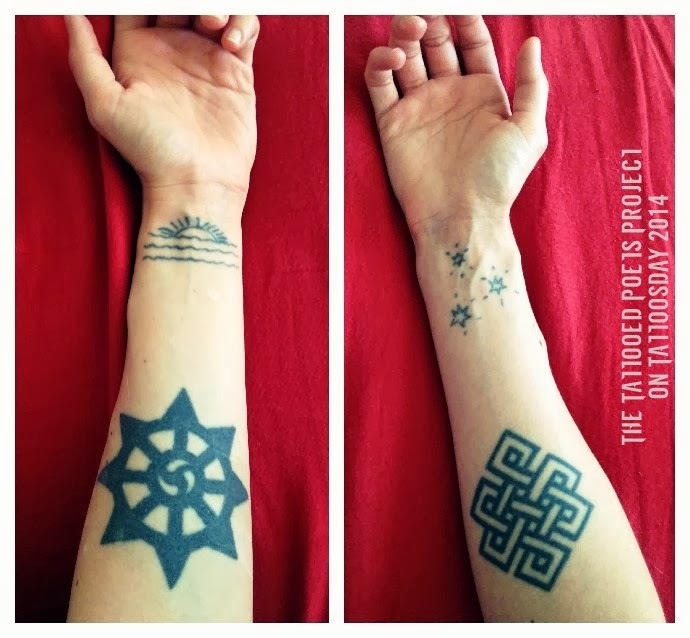 They're both Buddhist symbols--the dharma wheel [left] and the endless knot [right]. Even with reminders on my arms, I'm still pretty terrible at being present and not getting wrapped up in my own subjectivity, but the very act of getting inked was liberating for me. There's a certain freedom in handing your body over for revision, and creating change instead of resisting it." The tattoos were done by Daniel Jones in Roanoke, Virginia. Jones now tattoos out of Asylum Studios. You ask if I think about you dying. to its orange, inevitable impact. Of course I do. But you’re driving. Jen Coleman was a finalist for The Poetry Foundation’s 2013 Ruth Lilly Poetry Fellowships. Her work has appeared in The Southeast Review, New Welsh Review, Fifth Wednesday Journal, Vinyl Poetry, DIALOGIST, Buddhist Poetry Review, and elsewhere. She earned her MFA from Hollins University and lives in Roanoke, Virginia, with her two Manx cats.